It all started when dolfinariums started to became popular. For a dolfinarium they of course needed dolphins. So people started to catch them. Trainers would come to the beach and ''pick'' the dolphin they wanted. After the trainers left, all remaining dolphins where killed. Nowadays dolfinariums breed their own dolphins. Therefore hunting would be superfluous. Even now thats the case, there are still large numbers of dophins being hunted at several locations around the world. Like Peru, Taiji, the Solomon islands and the Faroe islands. Japan is best known for slaying dolphins, each year they will drive a large amount of dolphins to the bay or onto a beach. Adult and young will be separated, they then close the route to the open sea with boats and nets. Once the dolphins are captured they await a painful and slow death. 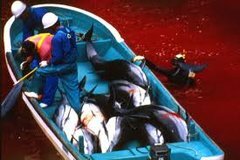 The fisherman will enter the water with small boats and spears and stab the dolphins to death. Most of the time the dolphin remain alive for an uncertain ammount of time, drowning and bleeding to death. The meat of those killed will be used for pet food, fertilizer and even human consumption despite the known danger of mercury contamination. However fisherman actually kill more dolphins then they can consume. Therefore they decide to give away free meat to children that are still in primary school. Childeren that are even more sensitive to mercury intoxication then adults. They can suffer from paralysis to disfigurement. And thats not all, the goverment actually supports dolphinslaughter. They see it as an rural tradition. DNA tests even show that dolphin meat is being sold under different names in local stores. People are being poisoned without knowing it. Its hard to stop dolphinslaughter while the goverment is covering everything up, and paying poor countries to share their opinion. There are even stories of people being killed that tried to help the captured dolphins. But its not impossible, these dolphins can use every help they can get. Will you be one of the people to provide them that help ?